Stoneware; hand-incised; 1.0L, 0.5L, 0.25L; pewter lid. 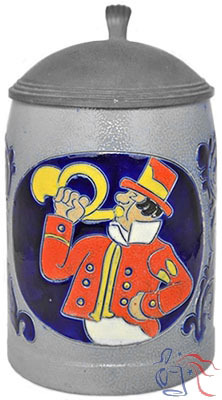 Postilions carried the mail between post houses along their route, announcing their arrival by blowing a “post horn” like the one pictured in the central image. 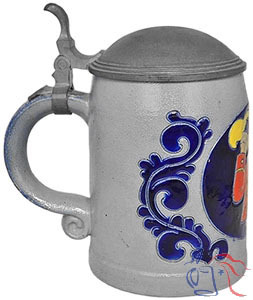 Appearing initially in a 1938 Merkelbach sales catalog, the intervention of World War II resulted in most production of this “handgeritzt” stein actually occurring in the 1950s through 1970s.